The ultimate combination of condition and remarkable provenance elevate this 1955 Brooklyn Dodgers team ball into rarified air. The ONL (Giles) ball features twenty-five autographs rated 7/10 by the stringent experts at PSA/DNA. Notable signatures include Robinson, Campanella, Reese, Alston, Hodges, Newcombe, Gilliam, Podres and the all-important Frank Kellert, whose lone season as a Dodger assures 1955 vintage. The signatures of Snider, Meyer and Loes have been deemed clubhouse. The ball itself is bright white and blemish-free, garnering an 8 rating by PSA/DNA. 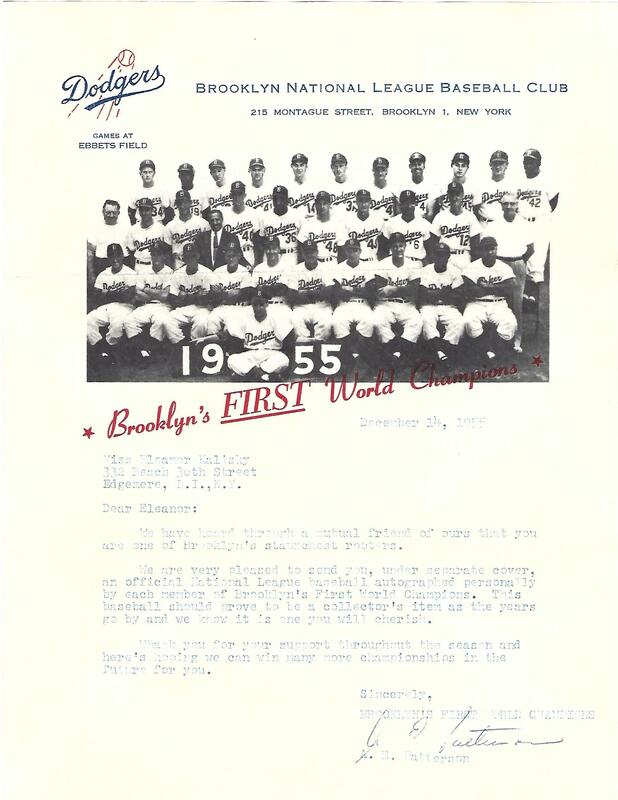 The ball is immeasurably enhanced by the accompaniment of an extraordinary official team letter on rare "Brooklyn's FIRST World Champions" letterhead with a printed team photo. The letter reads, in part, "Dear Eleanor: We have heard through a mutual friend of ours that you are one of Brooklyn's staunchest rooters. 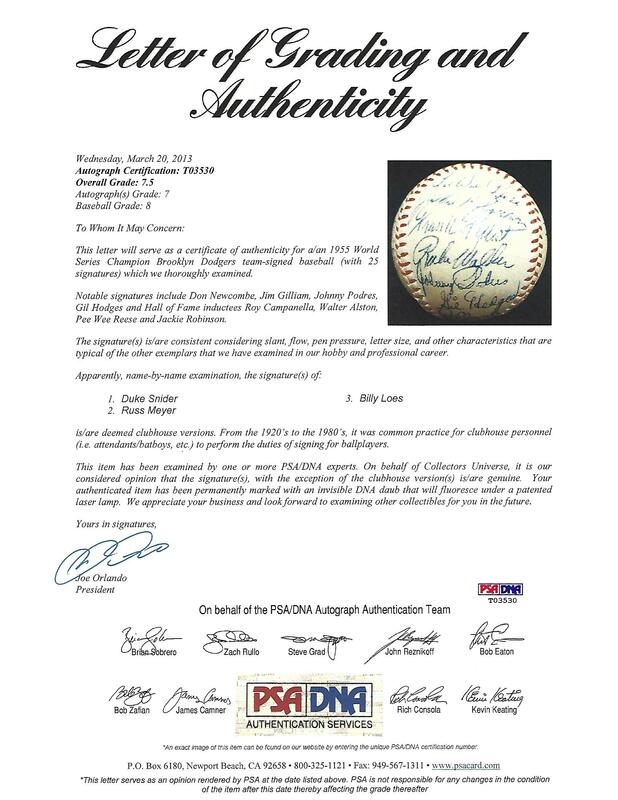 We are very pleased to send you, under separate cover, an official National League baseball autographed personally by each member of Brooklyn's First World Champions..." A matching Dodgers transmittal envelope is also included. A remarkable commemoration of the campaign of ultimate triumph for the beloved Brooklyn Dodgers. Full LOA from PSA/DNA with 7.5 overall grade (autographs 7; ball 8). Includes 12/14/1955 typed signed letter on Dodgers letterhead to the lucky fan who received this ball as a gift from the team for her loyal support. 25 signatures, of which three are CH (Snider, Meyer & Loes).